On César Chávez Day, lost in all the news about the Trump administration’s criminalization and scapegoating of immigrants and attempts to withhold federal funds from cities with policies that protect immigrants, are the 450,000 low-wage-earning migrant workers employed in the United States through the H-2A, H-2B, and J-1 visa temporary foreign worker programs. Many of the workers in these temporary visa programs are in a precarious situation and vulnerable to abuse and retaliation at the hands of employers and their agents. These “guestworkers” often arrive in the United States in debt, and are tied to and controlled by their employers. Research shows guestworkers are often paid lower wages than similarly situated U.S. workers, and earn wages similar to those of undocumented immigrant workers. This is reminiscent of the Bracero Program—a large guestworker program in the 1940s, 50s, and 60s that admitted hundreds of thousands of Mexican workers to work temporarily on U.S. farms and in other low-wage occupations—and which César Chávez fought against. Chávez knew that exploited, indentured, and underpaid workers would degrade labor standards for all workers in the United States, including immigrants. After scandals, political pressure, and President John F. Kennedy campaigning against it, the program was terminated in 1964. Sadly, America has not learned its lesson. The United States is repeating an historical mistake, once again admitting large numbers of guestworkers in low-wage occupations. With the possibility looming that the Trump administration will reduce enforcement and oversight in guestworker programs—which will be further exacerbated if Trump’s proposed 21 percent budget cuts to the Department of Labor (DOL) are enacted—the United States may once again face scandals like the one where the bodies of guestworkers who died in a traffic accident were not immediately claimed, because farm labor contractors and agricultural growers argued over who their employer was. The H-2A program allows employers to hire workers from abroad for agricultural jobs that normally last less than one year, including picking crops and sheepherding. 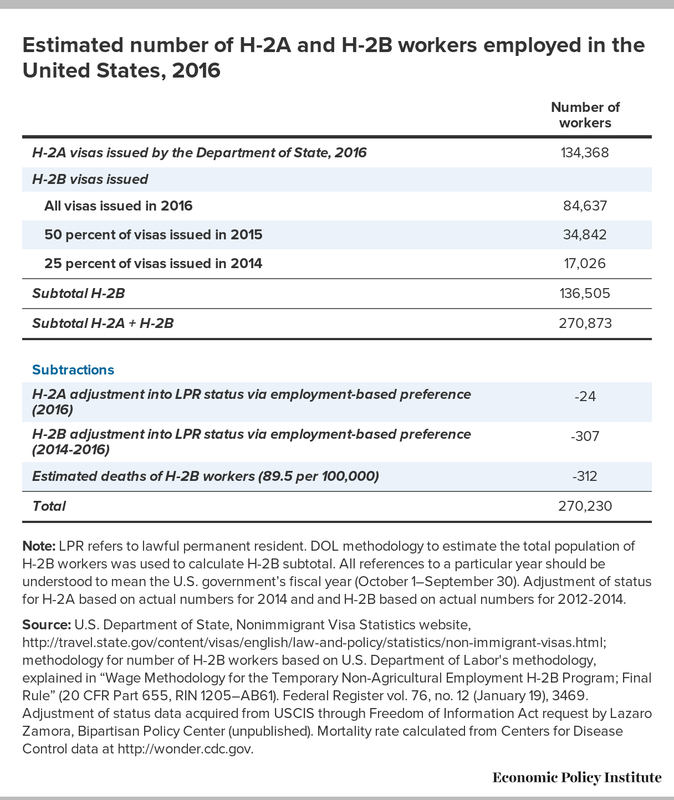 There is no numerical limit on H-2A visas, and in recent years, the H-2A program has grown sharply, doubling over the past five years to 134,000 workers, and accounting for nearly 10 percent of the crop labor force. H-2B workers are employed in seasonal (nine months or less) low-wage nonagricultural jobs like landscaping, forestry, food processing, hospitality, and construction. There is an annual numerical limit of 66,000, but workers often stay longer than one year or have their stay extended. Despite the cap on the H-2B program, a “returning worker exemption” allowed 85,000 new visas to be issued in 2016. The J-1 visa is part of the Exchange Visitor Program, a cultural exchange program run by the State Department that has 14 different J-1 programs, including programs that permit Fulbright Scholars to come to the United States, but also five de facto low-wage guestworker programs. J-1 workers in low-wage occupations are au pairs, camp counselors, maids and housekeepers, lifeguards, and staff restaurants, ice cream shops and amusement parks and national parks like Yellowstone. Only one of the five programs is numerically limited: the Summer Work Travel program is capped at 109,000 per year. Numerous media reports and legal proceedings have documented how H-2A, H-2B, and J-1 guestworkers are treated poorly. For example, Buzzfeed News asked whether H-2A and H-2B are “The New American Slavery?” and Politico Magazine reported this week that the State Department covered up and lied about thousands of complaints received from J-1 workers. Immigrant worker advocates have been sounding the alarm bells about all three programs for years, but the employers who hire guestworkers continue to lobby for more visas and fewer rules that protect workers. So, how many workers are employed in these three programs? Calculating the number of workers is not straightforward, and the government does not publish reliable data by visa. 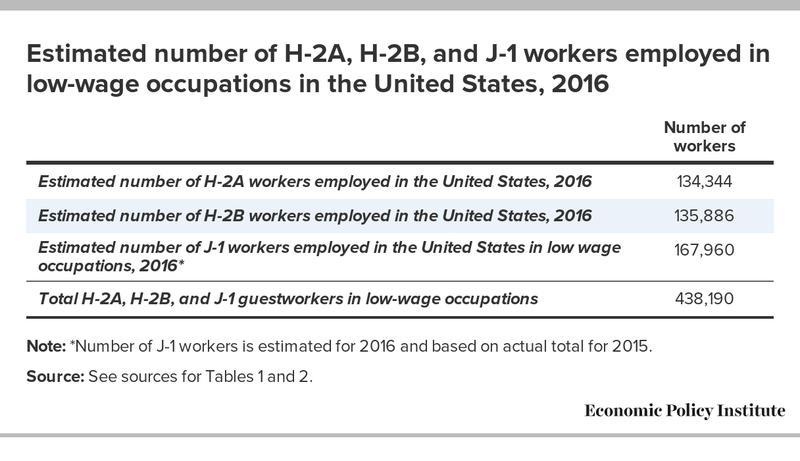 Using the same methodology I developed in this report, I estimate in Table 1 below that there were over 270,000 low-wage workers employed in the H-2A and H-2B programs in 2016. Table 2 shows that the number of J-1 workers in low-wage occupations was 167,960 in 2015, and the number in 2016 was likely similar (2016 data on J-1 are not available). The grand total of guestworkers employed in low-wage occupations in all three programs in 2016 is 438,190 (Table 3), close to half a million, but many were not employed in the United States for the entire year. On average, H-2A workers were in jobs certified to last for seven months, more than half of the H-2B workers counted were employed for the entire year, and most J-1 workers counted were employed for four months, but one-third worked for the entire year. Comparable estimates for the number of temporary Bracero workers are difficult to come by. 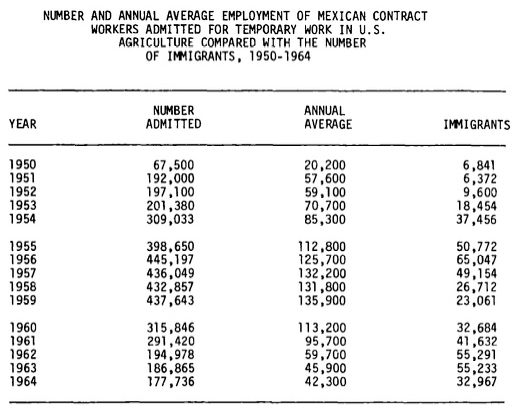 The most commonly cited statistic is that there were almost 450,000 Braceros “admitted” in the peak year of 1956, meaning that this many workers authorized through the Bracero program entered the United States. However, using admissions to count unique workers, as many reports have done, is misleading. For example, the number of H-2A workers admitted in 2015 was more than 2.5 times the number of visas (a proxy for the number of workers) issued that year, in part because some H-2A workers live in Mexico and commute daily to jobs in the Arizona and California deserts, generating an individual, counted admission each time they enter the United States. 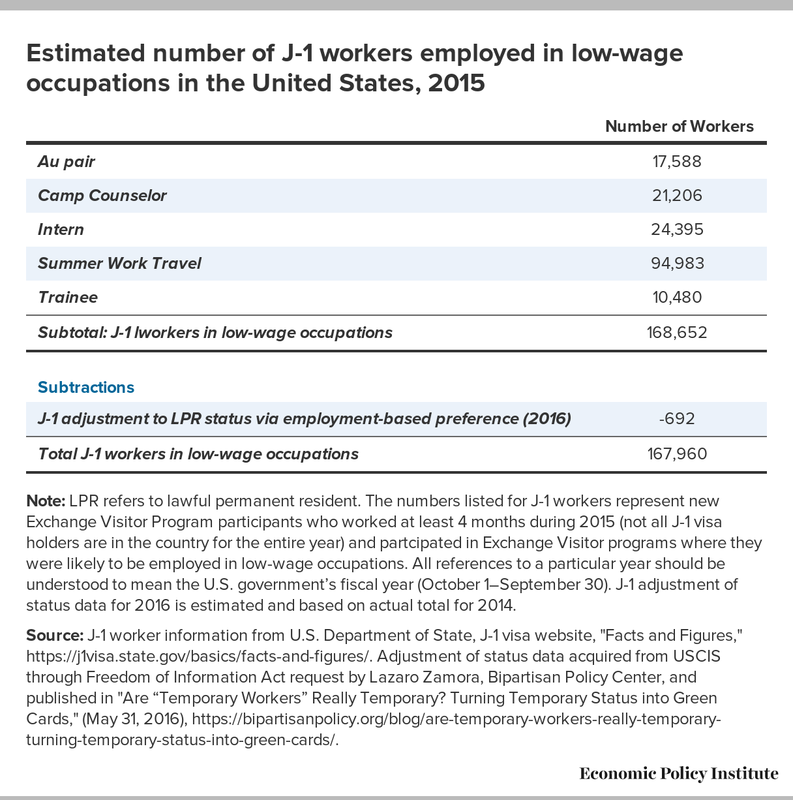 A similar “annual average” calculation of temporary, low-wage foreign workers present in the United States in 2016 would be lower than 438,000; but how much lower depends on the length of time that each individual worked in the United States. However, no matter how you count, there’s no question that there are more low-wage guestworkers today than there were Bracero guestworkers in the peak year for either Bracero admissions or FTE workers. Through an executive order, President Trump has already redefined the priorities for deportation so broadly that nearly every unauthorized immigrant is now considered a priority for detection and removal, and his administration is expected to step up enforcement against unauthorized migration on the southern U.S. border and at worksites within the interior of the United States. This will impact the five percent of the U.S. labor force that is comprised of unauthorized immigrant workers. Two-thirds of the entire unauthorized population has lived in the United States for at least 10 years, and unauthorized migration over the Mexico-U.S. border is at historically low levels, which means the Trump administration will mostly be trying to remove long-term residents who are integrated into the United States through employment and family ties. If a significant number of unauthorized immigrants are removed and fewer new workers arrive, employers are likely to request more guestworkers, particularly in agriculture, landscaping, hospitality, and construction. Employers seeking new workers are likely to pressure the Trump administration and Congress to create new temporary foreign worker programs and/or expand the current programs, as well as to loosen and curb the enforcement of rules that protect migrant and U.S. workers. Specifically, employers are pressing Congress to eliminate the requirement to provide housing for H-2A workers and they want to remove the cap on H-2B visas. This corporate lobbying blitz has already gotten underway, as many low-wage employers have become addicted to having indentured employees who can’t complain or legally search for a better U.S. job. Just yesterday, the Wall Street Journal editorial board called for more guestworkers in low-wage jobs, warning of a “growing labor shortage” in agriculture and construction. But they failed to mention that the earnings of most farmworkers are still extremely low and that the latest JOLTS data from the Bureau of Labor Statistics show there are three unemployed construction workers for every job opening—not exactly signs of a dire shortage. Both Democrats and Republicans seem to have a soft spot for employers seeking low-wage guestworkers. At a recent hearing, Republican Governor Sonny Perdue and Democratic Senator Kristen Gillibrand discussed and described the H-2A program as too “cumbersome” for farm employers, even though there is no limit on the number of H-2A workers they can hire and DOL has processed 99 percent of applications in a timely way in 2017. Low-wage nonfarm employers persuaded 32 legislators to sign a bipartisan letterasking the Department of Homeland Security (DHS) to audit the H-2B program in an effort to build support to expand the program (by exempting returning workers from the 66,000 a year cap). Republican-sponsored legislation to do just that—exempt returning H-2B workers from the annual cap—was introduced in the House this month, with two Democratic co-sponsors. Does the United States need to expand its modern-day Bracero programs? Changing and loosening the rules in work visa programs could lead to a quick doubling of the number of low-wage guestworkers in the United States. Is one million low-paid, exploitable, indentured workers—who have no path to lawful permanent residence and citizenship—what the U.S. economy needs? César Chávez would say, “No!” Migrants who come to the United States and contribute to the economy should be afforded civil, human, and labor rights, and a chance to become American. Furthermore, the number of jobs for workers with a high school degree or less has not yet recovered to the pre-recession levels of late 2007, and wages for less-educated workers have stagnated. In other words, labor market indicators do not suggest the United States needs more low-wage guestworkers. Then why are employers and Congress fixated on this? Changing the low-wage labor market in this manner deserves a fully informed public debate and Congress should be held accountable. Any expansion of low-wage guestworker programs should not occur through deregulation at the federal agency level or via must-pass omnibus appropriations legislation, as has occurred time and time again over the last decade. This article was originally posted at EPI.org on March 31, 2017. Reprinted with permission. 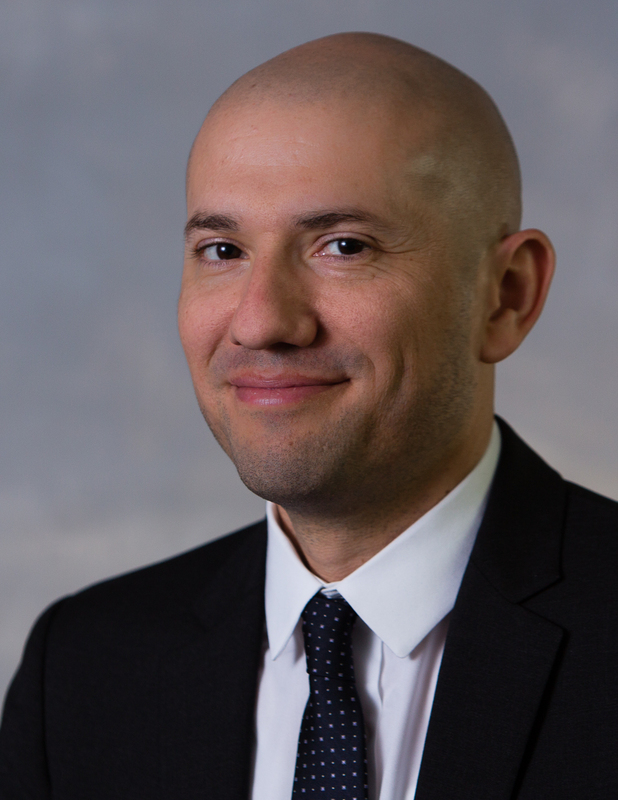 Daniel Costa has been director of immigration law and policy research since 2013, having joined EPI in 2010 as an immigration policy analyst. An attorney, his current areas of research include a wide range of labor migration issues, including the management of temporary foreign worker programs, both high- and less-skilled migration, immigrant workers’ rights, and forced migration, including refugee and asylum issues and the global migration crisis. This entry was posted on Friday, March 31st, 2017 at 3:58 pm. You can follow any responses to this entry through the RSS 2.0 feed. You can leave a response, or trackback from your own site.